The city of Grenada was one of our favourite places we visited on our month long trip to Nicaragua. 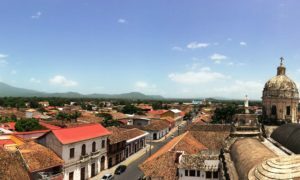 In this post we want to show you our top 10 things to do in Granada Nicaragua and why we think it is such a great destination. Since we visited as a family, we will also explain why it was a great family destination. You can easily spend a few days visiting the city and the nearby attractions. Need convincing to visit Nicaragua? Check out our 12 best things to do in Nicaragua and see for yourself why this is such a hot destination right now. Looking to plan your Nicaragua itinerary? Head to this post for 1, 2 and 3 week Nicaragua itinerary ideas. You can also read about our experience at a Spanish School in this post. Granada is one of the oldest cities in the Americas and its colourful buildings, colonial architecture and cobblestone streets are charming and exotic all at the same time. Named after the old city of Granada in Spain, this Granada has also developed into a tourism centre. The best way to discover the compact city is by wandering through the quiet streets and exploring the alleys, cafes, markets and shops you find. It may be a city, but it feels like more of a town and is quite easy to explore on foot. The city is rich with history and although the Spanish dominated the area, at times the British, Dutch and French pirates attempted to take control of the city. Add to that the wild west show that went on when William Walker tried to rule over Central America and there is lots to learn about this colonial city. Granada is probably the most visited place in Nicaragua and you can immediately see why when you arrive. There is a good blend of authentic Nica and western style amenities and services. You are going to want to stay somewhere near Parque Central as there is no question this is the centre of town. There is lots going on in this compact little square. Children playing, vendors selling, street food cooking, seniors resting, this picturesque park should be your first stop. It buzzes at anytime of day. Come people watch under the shade of a tree in the afternoon, but come back in the evening to see families eating together from the street food vendors. The Nicaragua Lonely Planet contains a good walking tour to see the major sites of the city. For those who like an organized tour, let the guidebook guide you around. However, Granada is a great city to simply stroll around. Every street has brightly painted buildings dripping with character making it a photographer’s dream. Get off the beaten path and peek down the little alleys into the local cafes, shops and neighborhoods. Wander through the markets to see the fresh, tropical produce and daily wares for sale. You won’t have to look very hard to find the horse and carriages waiting to whisk tourists on a tour of the city. They line up at Parque Central and the drivers can be aggressive in finding clients. It is a great way to introduce yourself to the city and if you pick a knowledgeable and English speaking driver, you can learn a lot about the history of the city. We really enjoyed seeing Cementerio de Granada and the abandoned hospital. This was an activity that both the kids and parents really enjoyed and we had a lovely driver named Salvador (#78) that taught us a lot about the city. 600C for a 1 hour tour. Catholicism is going strong in Nicaragua and there are countless beautiful churches throughout the country. The one you will want to visit first is Iglesia de la Merced, where you can climb the bell tower for sweeping views over the rooftops of the city. Like so many churches of the region, the outside is faded and crumbling. Inside is well preserved and the views from the top of the bell tower make it one of the most popular things to do in Granada. $1 USD/they did not allow children to go up to the bell tower. There are lots of other beautiful churches in Granada. Make sure you visit the Cathedral by the Parque, Iglesia de Xalteva, and Iglesia Guadaloupe. The Nicaraguan diet is made up of rice and beans (gallo pinto), but there are lots of other specialties to try. We loved the quesillos, which are a specialty of the area. These soft tortillas filled with sour cream and cheese are best tasted at Cafetin el Volcan. Another specialty is vigoron, charred pork with cabbage salad, wrapped in a banana leaf. You will see the many vigoron vendors in the Parque at night. Don’t forget to sample the famous Flor de Cana rum, particularly the 7 year variety. Our kids also appreciated the abundance of western food available at the cafes and restaurants in Granada. Calle la Calzada is the main street leading off from Parque Central. It is a touristy area of town with lots of shops and restaurants. The best time to visit is the early evening where there are street performers out and the restaurant tables overflow out into the streets. This was one of the highlights of our time here and for adventure seekers definitely one of the best things to do in Granada. We went through Miravalle Canopy Tour and were really impressed with the safety and staff. They were wonderful with the kids and it truly was a highlight of our trip. With 2 km of lines and 17 platforms, this is a great half day activity. The guides will challenge you to try various poses like superman and upside down. Of course it is also a great opportunity to see the jungle. We saw a few howler monkeys and there were so many mangoes, they were rotting on the ground. 3800C for our family of 5, including transportation from Granada. We booked a tour company on Calle la Calzada. 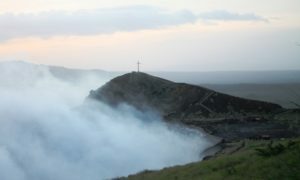 Nicaragua is known for its many volcanoes and you absolutely must visit one while in the country. This is Nicaragua’s largest National Park and only 30 km from Granada. You will smell the volcano even before you get close and the Visitor’s Centre is a good place to start for a geography lesson. We visited right before sunset and the lighting was absolutely beautiful. You can take a daytrip and combine a trip to Masaya with a stop at Laguna de Apoyo (below). We also did the cave tour where you see loads of bats. This freshwater crater lake is located 30 minutes from Granada. You could spend a couple of days here if you are in need of relaxation time. Or visit for half the day and enjoy a swim and water sports in this pristine lake. There are lots of resorts that host guests on day passes. It is a beautiful setting with bright blue waters naturally heated by thermal activity. This should definitely be one your list of things to do in Granada Nicaragua. The isletas are small islands sprinkled just off Granada on Lake Nicaragua. A popular daytrip is to explore the isletas by kayak or boat. 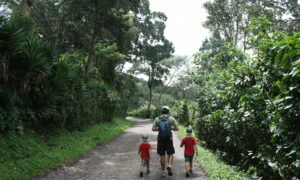 You will see lots of bird life and a whole island overrun with monkeys. You probably only need an hour boat trip to visit the isletas, but you can also do a longer tour with lunch included. Casa del Agua (budget) was such a great find that we returned there twice. Located a couple minutes from Parque Central, this truly was a home away from home. The friendly owner Gerry is super welcoming and a great resource for planning your time in the area. Located in a quaint heritage building with a court yard pool and common area (with kitchen), there is so much to love about this place. We really enjoyed meeting travellers from all over the world. For families, they have a lovely family room with a queen bed and bunk beds. All of this at a very reasonable $50 USD/night. It is a small guesthouse and they book out quickly, so book in advance. Click here to book this awesome guesthouse. Hotel Plaza Colon (mid-range) is located fronting on to Parque Central so right in the heart of the city. The colonial architecture, large rooms and refreshing pool make this place a great choice. Ask for a room with a balcony overlooking the Parque. For families, some rooms have 2 queen beds. Hotel Casa San Francisco (mid-range) is another top performing hotel in Granada. It is centrally located in a quiet neighborhood. You will appreciate the small pool, friendly staff and complimentary breakfast. This small boutique hotel is charming and peaceful. 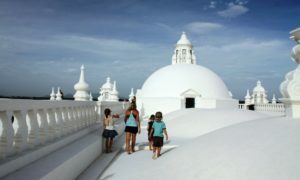 If you are coming from the capital Managua and the airport, the quickest and easiest way to get to Granada is by organizing a private taxi in advance. It is only a 45 minute drive, but when I land in a new country, I appreciate having someone there waiting with my name on a sign. You can organize this with your Granada hotel at a very reasonable rate. At times Granada might feel like it is purely a city of tourists, but when traveling with kids parents will appreciate the good amenities it offers. We felt completely safe in Granada and it was a city the kids really enjoyed. There were some stray dogs around, so make sure you teach your kids to not approach them. Nicaragua can get really hot so make sure the kids are drinking lots of fluids and take a break and re-hydrate by enjoying the many cafes. For a very reasonable price, you can get a hotel with a pool, which is always a hit with our kids. They really enjoyed the carriage ride and of course the zip lining. They were feeling a bit sick of beans and rice and were thrilled to see some Western food choices on the menus here. There are so many wonderful day trips that kids will love. Visiting a volcano, swimming in a crater lake and exploring the markets and villages in the surrounding countryside all passed our kids expectations. 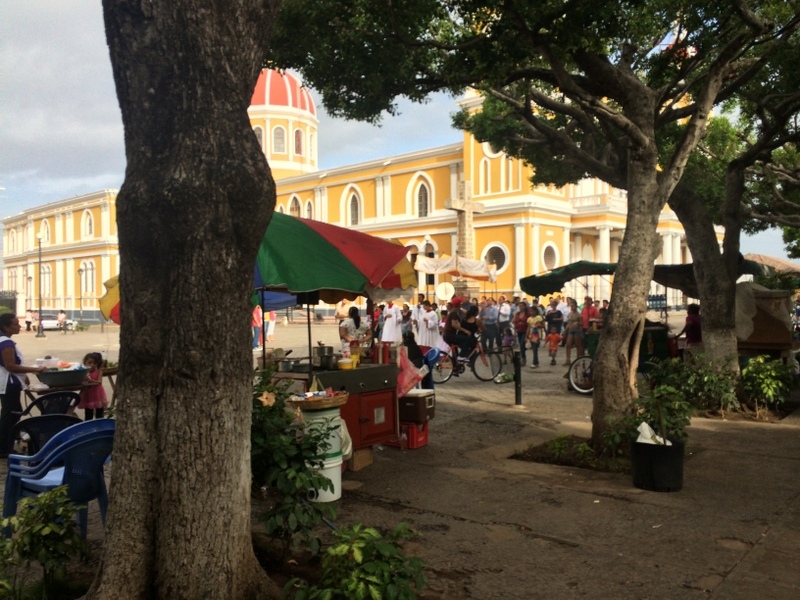 We loved Nicaragua and Granada embodies so much of what you think about when you think of Central America. The city has so much to offer, but don’t forget to visit the surrounding areas for your nature and adventure fixes. We hope this post has given you lots of great ideas of what to do in Granada and Nicaragua. Definitely put it in your itinerary Mariella! I totally like gallo pinto too, even the fried plantains! The architecture looks incredible. South America is on my list… Nicaragua seems like a must! Great read. Yes! Granada is one of my favourites. Love your list. I would add going to a cigar factory. It was fascinating. The carriage rides were my favourite. Glad you liked Granada as well! The cigar factory would be a really cool experience – great tip! I have always wanted to go to Nicaragua – your list is super helpful, saving for when I eventually visit! Thanks Leigh! It was our first real taste of Central America and we are super keen to go back. Enjoy that trip! Granada is wonderful, but the whole of Nica is amazing. Great post. The Masaya Volcano looks like it would be an incredible experience! Love the pictures as well! Thanks so much. Masaya Volcano was really cool to experience. Luckily in Nica, there are so many volcanoes to explore. I’ve never really thought about a trip to Nicaragua, but now I’m curious! Saving this for if/when the time comes! It is a great country Rachel. I liked that tourism hadn’t taken over and it still felt very real. Lovely family in a lovely city. Family goals! I’ve always wanted to visit Nicaragua. It looks beautiful. wow what a detailed guide. This is so so useful, thanks so much. Glad it was helpful! Beautiful city for sure. Nicaragua seems spectacular! I haven’t visited it yet but I hope to cross it off my bucket list soon! Nicaragua is pretty great. Definitely try to fit it in Agness! Love it! We’re taking our 4 kids to Nicaragua in September so this came in great time! How old are your kids? I went to the zip-lining website and they say they don’t accept kids younger than 10. You guys are going to love Nica! How long are you spending there? Not sure why the site says that, but the Facebook page looks more up to date: https://www.facebook.com/pages/Finca-Miravalle-Canopy-Tour-Nicaragua/172150999576900 My youngest was almost 4 when we went and it was no problem at all. Tripadvisor reviews show lots of families with kids going. We didn’t book in advance, but just organized through a travel agency on Calle de Calzada the day before. https://www.tripadvisor.ca/Attraction_Review-g580113-d3179243-Reviews-Miravalle_Canopy_Tour-Granada_Granada_Department.html#REVIEWS Let me know if you have any questions or if I can help in any way. I have a bunch of other posts about Nica on the blog in travelogue style.